Most people have problems comprehending big numbers. I’m not talking about accurately comprehending the number of drinks you’ve had, the kilograms you are currently overweight, or even the size of your personal domain of fame. No, I am talking about issues with comprehending really big numbers. How many people can really imagine the world’s entire human population? 6 going on 7 billion! How many people can really comprehend a number like that? Particularly when, for most of us, the world’s population is generally calculated more like this: (me+family+workmates+people I know personally) = (a really big number) ≤ (the number of folk in my local city) which, in turn, is approximately = reality as I understand it. All the rest [(world’s population) – (local community)] is just an abstract number. Just like all those grains of sand in all the world’s other beaches. The importance of our local community, if not our own self-importance, if not the importance of everyone else we could ever know, was rather emphatically demonstrated at that point. Big numbers and big dimensions are humbling… or should be for such a self-obsessed species as ourselves. All of which, I think, explains the current head-in-the-sand absurdities of contemporary arguments and denialism over the contributions of humans to global warming. This argument, so everpresent in the more conservative circles of modern society (the professorial tea parties of contemporary academia, for starters…), and amongst all the rest of us who lack an education and/or an intellect. No, most folk can’t comprehend the accumulative destruction we collectively dump on this poor pale blue dot of a planet to which we are currently confined. The logic works like this: my own personal emissions are small. Because I can’t comprehend numbers bigger than (say) 12, the collective contributions of society as comprehensible to me (my local town, say) must also be small. Therefore, human-induced global warming must be bunk. Or at least it must be bunk in my back yard (which is, let’s face it, pretty much the whole world that’s comprehensible to most of us – everywhere else is just the stuff of marketing fancies in travel brochures…). Consider this warning… The fumes just this one bike emits are enough to kill me. Where do those fumes go to? Do they leak into outer space and gas aliens in the Betelgeuse system? No. They are glad-bagged into the atmosphere clinging precariously to our planet. Now imagine how much a car with 2 – 3 times the engine size of my bike might emit. Now multiply that by, wait for it, 700 million (cars in the world today)! That’s an incomprehensibly huge emission of toxic fumes! Every minute of every day, day in day out, year after toxic year. 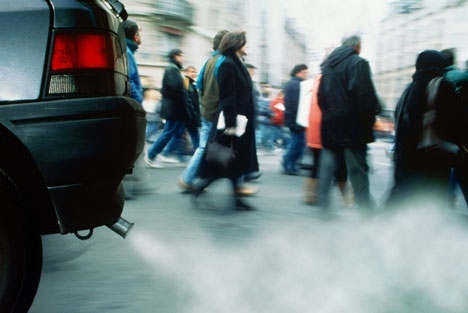 Most cars are currently emitting something like 350 to 500 grams of carbon dioxide per kilometre travelled. How could this kind of thing NOT harm us or our planet? That’s a big clean-up burden for those trees we have condescended to leave in the ground (an acre of forest is needed to clean up the emissions of each of those 700 million plus (and growing) cars per year, more or less…). Putting aside the science of atmospheric dynamics et.al., I’d simply propose this simple experiment through which we can re-connect with the consequences of our comprehensibly local actions. If you live in a city, go visit a national park (well away from civilisation) for at least a week. Clear your lungs. Return to the city. Breathe in. What do you notice?! If you live in a rural place, go visit the city and breathe in the air. If that’s not enough to prove the point, take up urban cycling. Ride in traffic. You will see what I mean pretty quick smart. Your eyes will water, your lungs will scream. You will die a bit more for every second you spend in the fume tanks of our urban places. 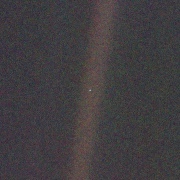 Is this not a graphic pale-blue-dot moment through which we might connect to the realities of what it is that we each do to this planet of ours? How can any person put his or her head in the sand of non-contributive innocence when he or she drives a car? But still we deny personal responsibility! And keep on keeping on doing it despite all the oceans of government clean-up-our-act rhetorical spin. People stick to their delusion that it’s not what I do but what everyone else does that is the problem. Why and how does the individual become so separated from the notion of personal contributions to collective consequences on the occasion of driving a car? I know how to fix the problem. Instantly. It’s a perfect cure. It’s a perfect way to connect the consequences of individual actions back to their perpetrators. Connect a pipe to the end of your exhaust pipe. Channel that pipe back in through the window of your cabin. Keep the windows up and inhale. Then cyclists will, truly, finally, inherit the earth… As Darwin’s logic would inevitably postulate.